Known as the “Golden Land”, Myanmar continues to sparkle as a tourist destination. Isolated from the rest of the world during an extended period of self-imposed detachment, the country formerly known as Burma rarely fails to weave its spell on modern-day visitors. Many come hungry for a flavour of bygone Asia, a spicy proposition that has lost its pungency in more developed neighbouring countries. In much of Myanmar, life drifts easily on much as it has done for centuries. Even the biggest city, Yangon, with its condos and growing selection of bars, retains an old-world allure through its crumbling architecture and evocative gold-spired pagodas. Until recently, such nostalgia could just as easily be applied to the nation’s contingent of golf courses. A one-time outpost of the British Empire, Myanmar has a long history with the game. In fact, the oldest golf course in the country – Thayet Golf Club – dates all the way back to 1887, making it one of the most venerable clubs in Southeast Asia. Despite this heritage, golfers visiting Myanmar today will find plenty of golf that meet the requirements of the modern game. The most logical place to start a playing adventure in the country is in Yangon, which offers easy access to a host of compelling clubs. Among these, the Gary Player-designed layout at Pun Hliang is a stand out. Constructed over former paddy fields where the Hlaing and Pun Hlaing rivers meet the Yangon River, the course presents a formidable test, with hungry water hazards lying in wait on many of the holes. Another Yangon course that is guaranteed to impress visiting golfers is the one at Mingalardon Golf and Country Club. Although it was only established in 1995, the course is laid out over a fantastic chunk of land, with giant tropical trees, well-constructed bunkers and nicely integrated water hazards giving it a pleasing air of maturity. Other fascinating layouts near Yangon include Yangon City Golf Resort, which has 36 solid holes, and the historic Yangon Golf Club, which still presents an excellent challenge despite dating back to the early years of the 20th Century. There’s plenty of golfing life outside the big city in Myanmar too. Witnessing the temples at Bagan is a must for visitors, and the 18-hole course at Bagan Golf Resort adds a prime golfing component to this bucket-list experience. Equally essential for visitors is a trip to tranquil Inle Lake – one of the country’s most beautiful spots. Near here, the Aye Thar Yar Golf Resort offers visual manna and great golf in equal measure. Situated around 3000-feet above sea level in the highlands, the course gets refreshing breezes all year round and is surrounded by glorious mountain scenery. 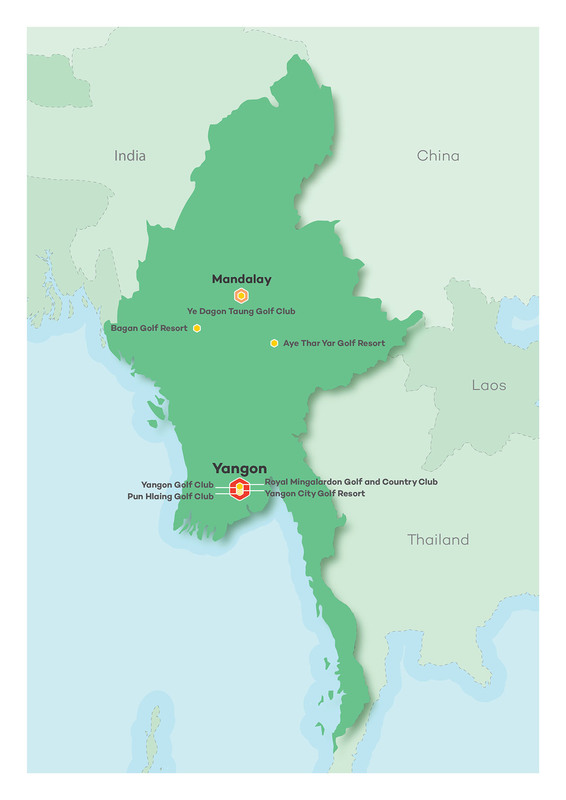 Near virgin territory as a golf destination, Myanmar is likely to surprise visitors with the diversity and strength of its playing options. And with the country continuing to open-up to visitors, now is the perfect time to sample its heady and distinctive brew.